Below is more information from the CDC about food safety. 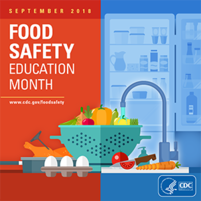 In observance of Food Safety Education Month, CDC is sharing information on the risk of foodborne illness and steps people can take to protect their health. Everyone is at risk of food poisoning, but some groups are at higher risk. Children under the age of 5, adults age 65 and older, pregnant women, and people with weakened immune systems are more likely to get a foodborne illness, and to get seriously ill.
We advise people to see a doctor if they experience severe symptoms such as high fever (over 101.5°F), bloody diarrhea, frequent vomiting, diarrhea lasting more than three days, or signs of dehydration. Help increase food safety awareness in your community by sharing key messages through social media, on your website, and in your newsletters. Watch and share videos of groups at higher risk for food poisoning and severe symptoms that should lead to a doctor’s visit. Join the food safety Twitter chat on September 24 from 2-3 p.m. ET, co-hosted by Media Planet, the National Restaurant Association, and CDC. Use #FoodSafetyChat to join the conversation. Promote food safety resources for restaurant managers and environmental health professionals. Share information for health departments as it relates to their role in outbreak investigations. Learn other food safety tips for eating at restaurants, also available in Spanish, and how to report a foodborne illness.